$45 Rebate on a $45.oo Purchase?? Buy the Duck9 program for students at $45.00 and get a $45 rebate. So if you teach at Stanford engineering like me, you can calculate that it is zero cost. 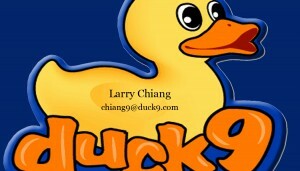 I am Larry Chiang and I invented Duck9. I also invented the “Larry Chiang Reverse Rebate Model” It used to be called LCRM: Larry Chiang Rebate Model. It reduces sales friction. Yeah, I am the same “Larry Chiang” that hacked his way to star in a Capcom video game to impress NFL Athletes, here and here. Yes, I mentor them on FICO credit scores too ( NFL rookie camp and Superbowl). In real life, I am not a 6’5″ butcher that throws cows. I am 6’5″ ex-varsity athlete. – You do NOT need to mention duck9. For goodness sakes, we do NOT NEED more press. Our CEO, me, is a huge media WHORE. Do not even “DuckDuckGo” / search it. Yeah, DuckDuckGo is a new search engine all the cool kids are on. – If at anytime you’re unhappy with the knowledge Duck9 is paying you to receive, you can text message ‘REBATE me now Biatch’ to the CEO’s secret cell phone http://twitter.com/650-283-8008. 13 million college students have been lead generated. Zero complaints. Act now and we’ll throw in a book: “101 Secrets”. It’s a $19.95 book, yours free.